On Thursday the 16th Chris arrived from Edinburgh. 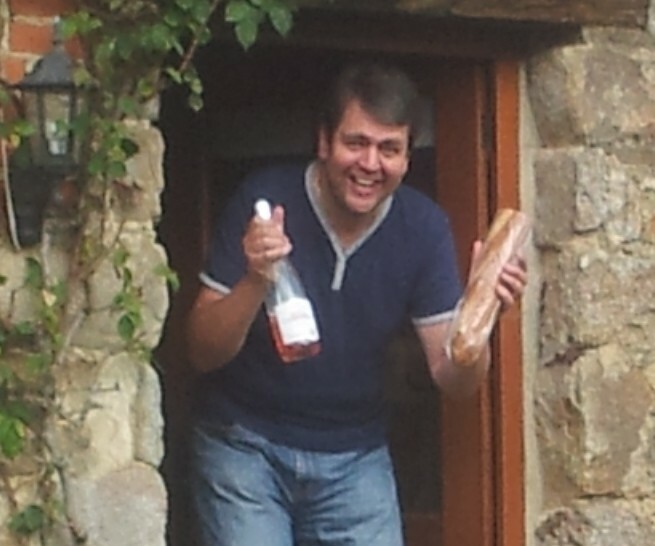 He’d survived the flights via Southampton and seemed pleased to find France warm and sunny. 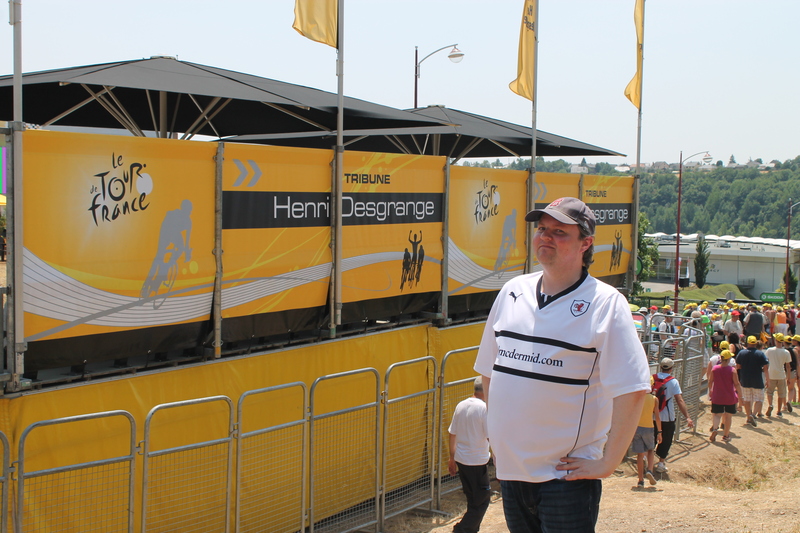 Due to his early flight and our trip the next day we took it easy heading for the hoose and watched the end of the stage of the Tour on TV and then had a quiet evening. 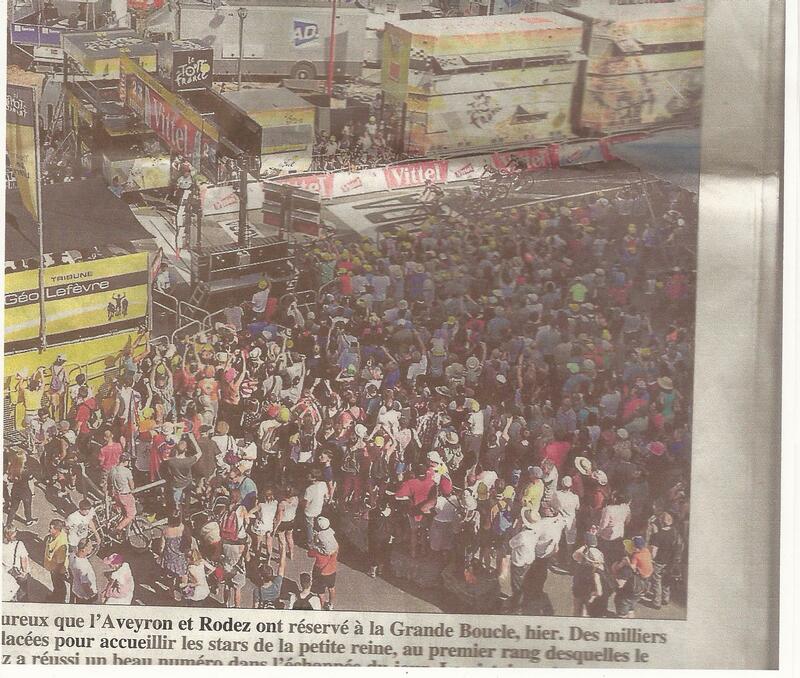 The next day we were up at 0600 and soon on our way efficiently heading for Rodez. (Rose had already kindly said she’d check on and feed Mitzy.) My purely subconscious attempt to leave my wallet behind was foiled when I realised and re-opened the gate and went back to get it… The day was developing into yet another hot and sunny one. 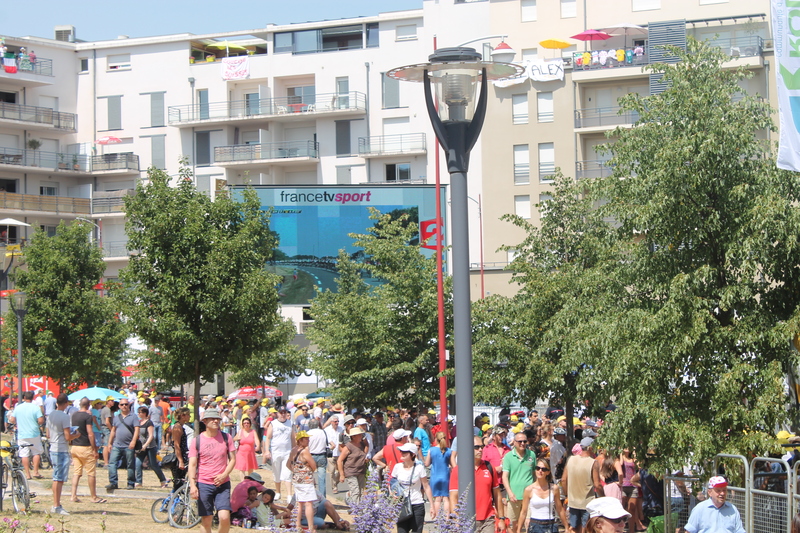 We had established where the Tour de France stage to Rodez was finishing and via the computercleverness of the interweb had worked out where it was amending our initial plan of throwing ourselves at the mercy of the Tourist Information office. We paused in Figeaus for a drink and continued making good progress. We knew the way after our Milau trip – Chris was acclimatised to French roads when a car pulled out almost into us avoiding parts of a freshly blown out tyre from a lorry that had just stopped. Seeing Winnebagos as we arrived in Rodez we swung up the hill past them, more by fluke than design we were at exactly the right place – I could have pretended it was on purpose but both S and C know me better than to believe that… Sure enough it was busy and between the modern buildings crowds of brightly clad cycling fans were amassing. Following the traffic around I took us off the main road in an effort to find somewhere to park, no easy task despite the finish of the race not being for scheduled for about another 5 hours! Here however years of practise trying to park prior to football matches kicked in and turning away from a diversion everyone else was following we parked and set off with bottles of water re-traced our steps. Geniez a local lad who rides in the FDJ team (aka Francais deux Jeux – the French lottery people). Walking back around we were amazed to discover that the best place we’d spotted for watching was still free. Thus we took up position by a couple of large boulders that divided the in and out access to a modern blocks underground car park. When the time came we’d be able to get onto said rocks and have a good view of the finish from a couple of feet higher up than the rest of the crowd. Sorted. The atmosphere was good and lots and lots of people arrived and took up places around us or moved on hopefully down the hill. 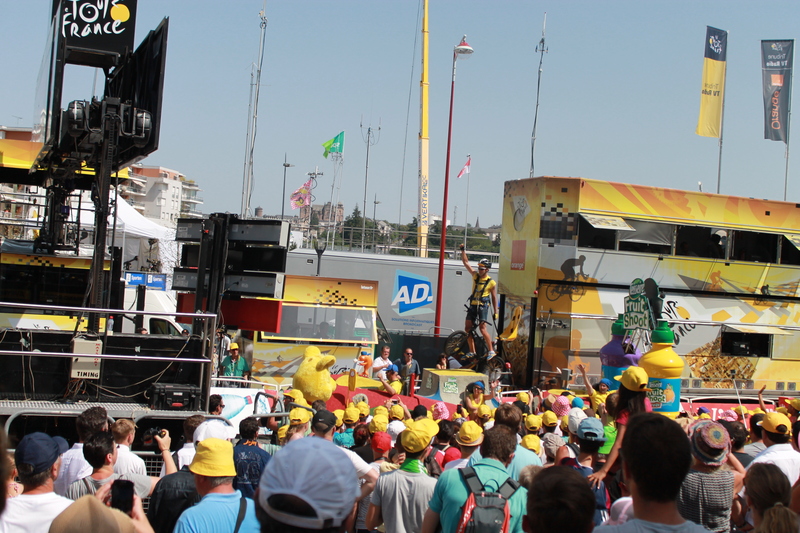 The caravan of sponsors vehicles arrived, distributing freebies and in Vittels case spraying the crowd with water – which was much appreciated. The mainly young people involved in the caravan looked pretty pleased to have reached the finish in the conditions. 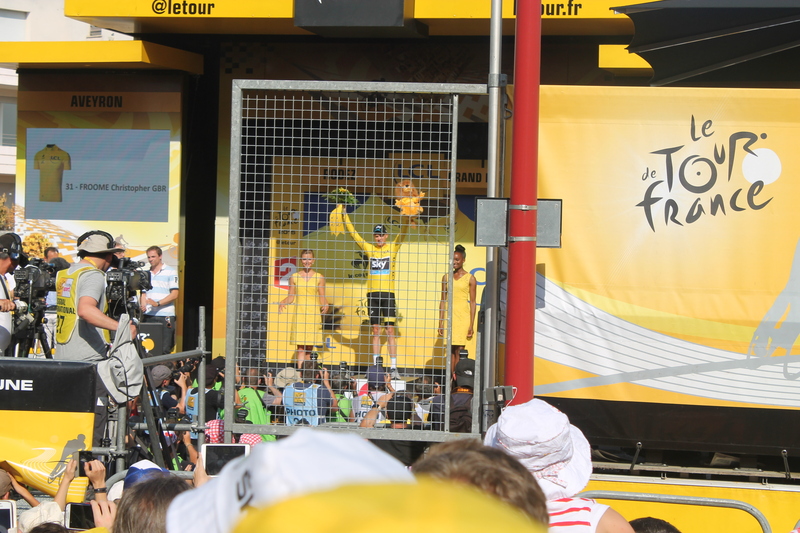 By now the crowds at the barriers were six or seven people deep and with an hour to go all the best and even mediocre viewing positions had been snapped up. Haribo folk were trying to throw sweets up to people on 4th floor balconies with some success. Despite the heat three poor people were dressed in mascot costumes, a Haribo bear, a Credit Lyonnais Lion and a Skoda superhero type guy. How hot it was under their foam heads and outfits goodness only knows. A couple of Brits had taken up position on the boulder behind ours. They were following the Tour into the Alps and had been to Alp D’Huez previously. As the anticipation grew Pompiers moved through the throng past us and removed a person who had clearly been affected by the heat. A few other the red ambulances seemed to be making similar trips. 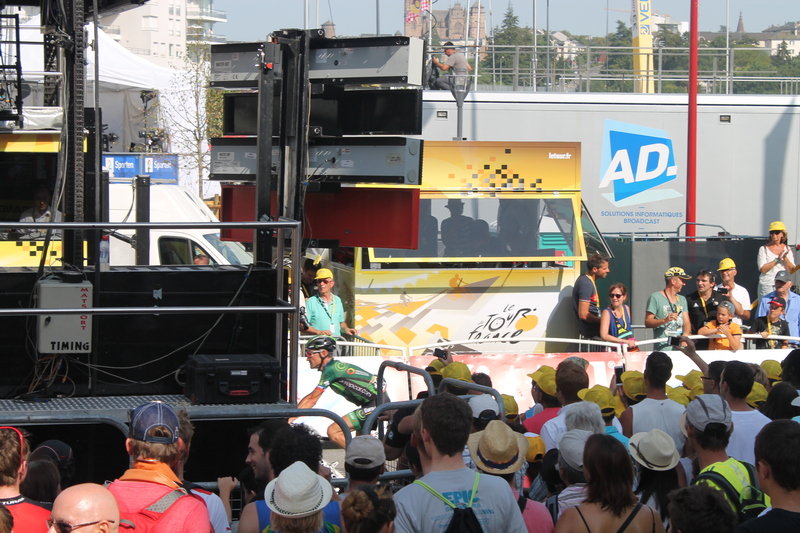 The big screen showed the countdown of the distance to the finish and a breakaway was caught as the PA told those of us who could follow the French what was happening. The cool shadow moved away from our rocks as the team buses went past. As it got busier a chap clambered up to join S with me and C on the rocks. 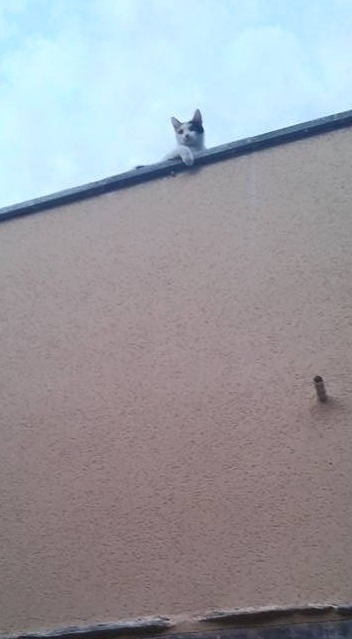 We were about 2 feet higher up and had a good view, S’s was snapping away with the camera as best she could. Then the riders arrived – I’d feared we’d not get a good view and all would whizz over the line in a bunch taking all of fourteen seconds. 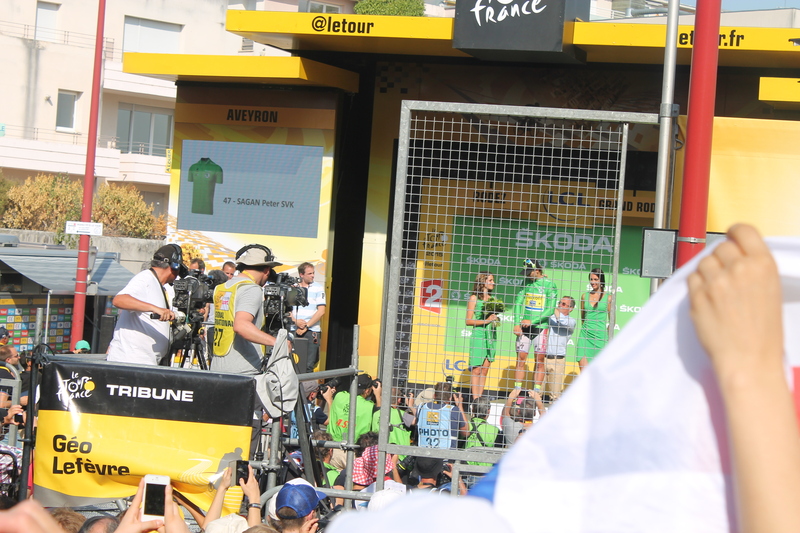 Thankfully from our vantage point we were able to see a BMC shirted rider out sprint the Green jersey wearing Peter Sagan to win the stage. 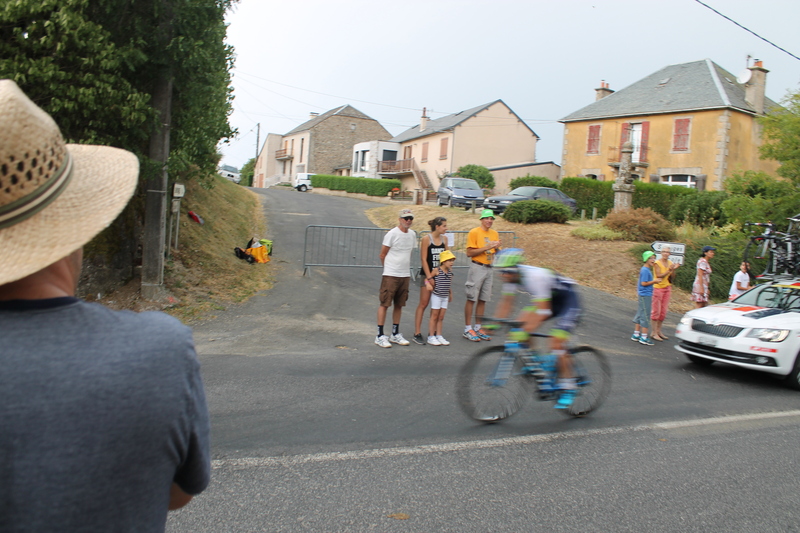 Just behind him in 6th came the yellow jersey worn by Chris Froome. 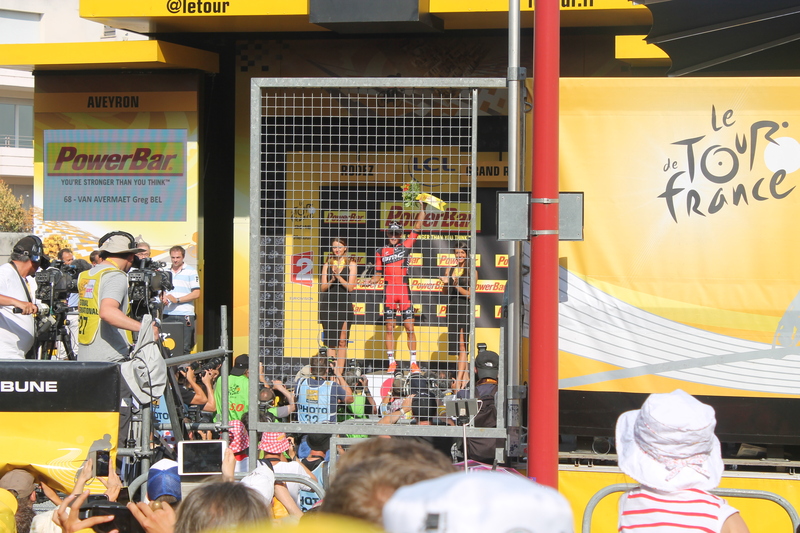 The BMC guy who took the win was the Belgian Greg Van Avermaet. We had a real advantage being higher up, S would have struggled to see anything at ground level – and I saw the veteran Frenchman Tommy Voekler who crossed the line in 93rd. 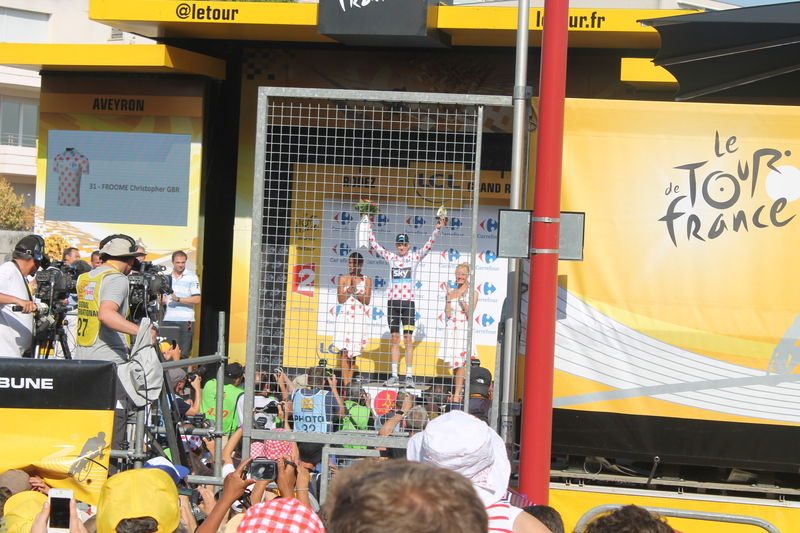 It took Irishman Sam Bennett 21 minutes 37 seconds more to complete the stage than the winner by which time we’d moved seven or eight yards to our left where we had a good view of the podium and presentations. Out came Van Avermaet the stage winner then, Froome for the Yellow jersey, Sagan for the Green, Froome again for the King of the Mountains (spotty) one, then Quintana for the White jersey. In a decent day for the Belgians De Gendt was presented with the combatively award and then the Movistar team came out as they were leading that classification. The ceremony was accompanied by Sweden’s Eurovison winning tune without the words – in heat like that all the riders were Hero’s. Having lost then refound Chris we toddled along seeing all the bars and one shop were heaving with hot and thirsty fans. Heading back to the car we watched as the team buses moved away with a no doubt tired cargo. S saw some riders already had their feet up. One of the buses was featured during the TV coverage one day and it had a shower on it! The car was effing roasting – 42 degree’s – when we climbed somewhat unwillingly into it. Our remaining drinks in the boot were very hot but the ones in a cool bag were tepid and very welcome. The queue to get away from the finish unsurprisingly took a wee while but it was fine – we’d done very well and seen more than we’d hoped. The hotel was I believed a former convent and is quite a striking building. To our surprise inside we met a couple of nuns! They helped us find the right person to get us in the rooms. 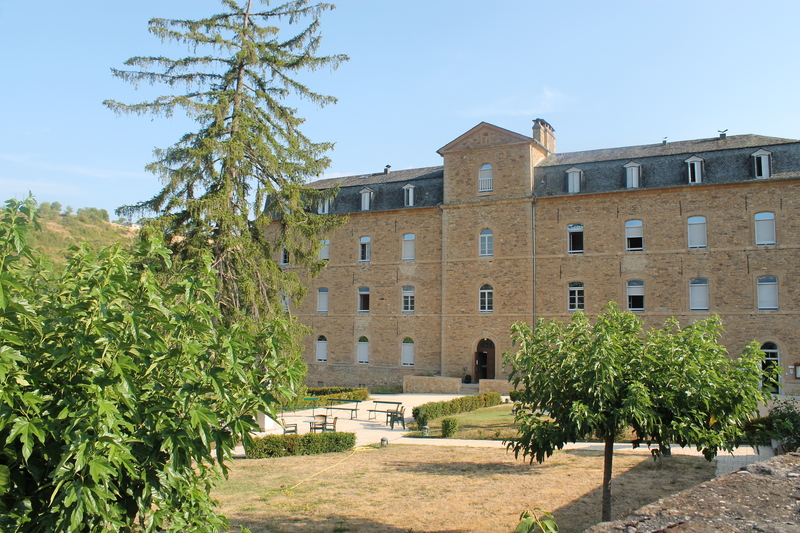 The place obviously still has a few Sisters resident and gets a lot of pilgrimage trade being on the Compostela route – our visit and devotion was however to follow those en-routes to the Champs Elysees. We went into the village of Saint-Come-d’Olt (another Plus Beau Village) and C and S had pizza’s while I had a ducky salad which we washed down with lots more fluids. We then promenaded around the village which was pretty and populated by several cats who looked more than vexed it was so warm despite it starting to get dark! Our lap ended with Madame patron re-uniting C with his hat which he’d left in the restaurant. Back at the Hotel the rooms were simple and lacked a TV but each had a little Jesus. I failed to tune ours in so gave up and after cool showers we went to bed. I had opened our room door earlier to go give C our interweb dongle-doda and was startled by a ninja nun. Thankfully I didn’t swear. The next morning we got up and set off. We paused to buy stuff for breakfast and headed off largely ignoring our planned route. I dropped bits of pain au chocolat on my khaki short but disaster was averted by a wee dance at the roadside to remove said crumbs. Weaving through the hills we passed a dam which held back turquoise water that looked absolutely stunning as passed heading south for our second stage. It was a nice day but thankfully cooler than the previous. 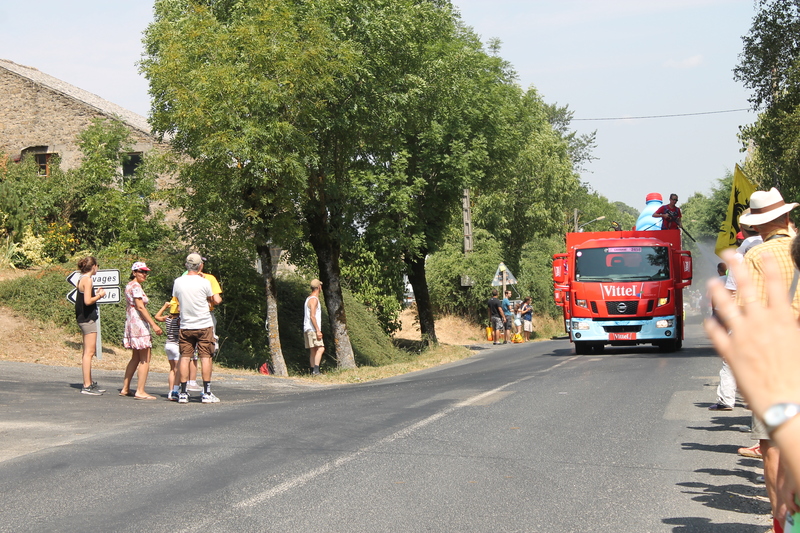 We met Tour traffic as we approached the small village of Bouloc with a couple of cars behind us. Parking at the roadside with others and going on to the main street the Tour would go down. 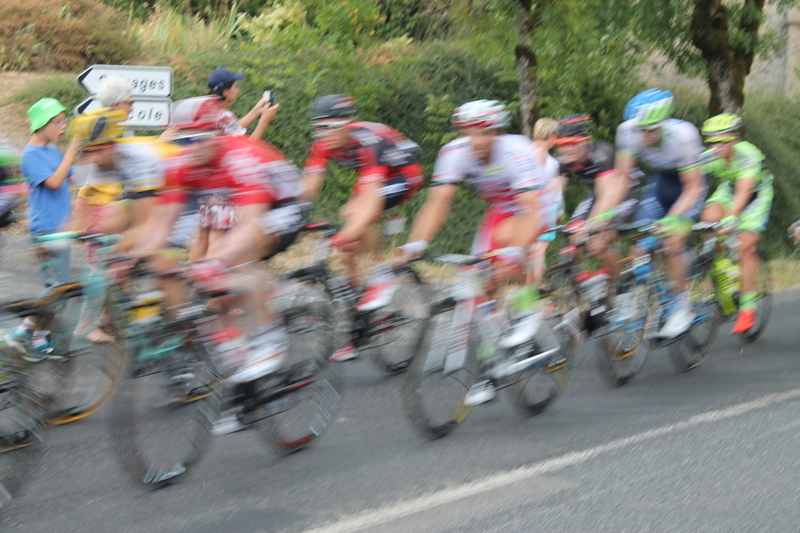 We wandered up and down the road as officials, sponsors and team cars started going past as other spectators arrived. Taking up position in the village square we waited. The locals were enjoying the day with several parties going on in gardens as the population of the village temporarily tripled or more. 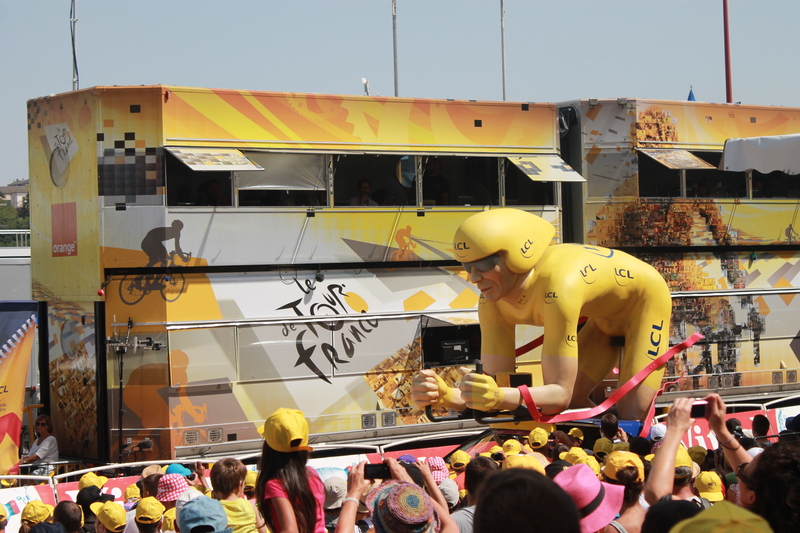 The Sponsors Caravan went past and we amassed more free things from rather fresher looking youngsters who’d only been on the road for 40k’s or so… The Can Can girls and cyclists atop various floats looked much more vigorous. A free local paper showed us on the front page, among others, stood on our boulder vantage points. 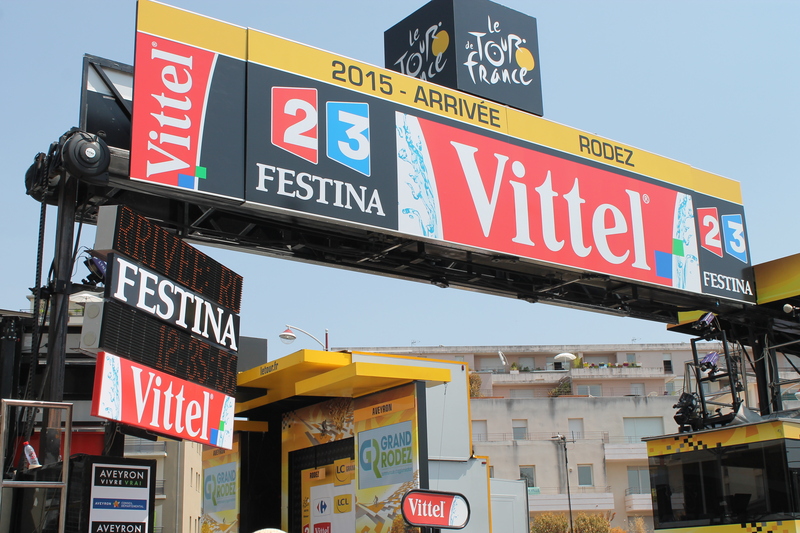 It was cooler but a squirt from the young Vittel woman was still a good thing. Some of the locals went inside for a drink no-doubt keeping an eye on TV as the peleton approached. Others were tailgating. A car went past saying on a PA system that they were coming and flogging Tour stuff. Then another car told us there was wee break and they would be with us soon – as we feared would be the thunder which we could just hear in the distance. 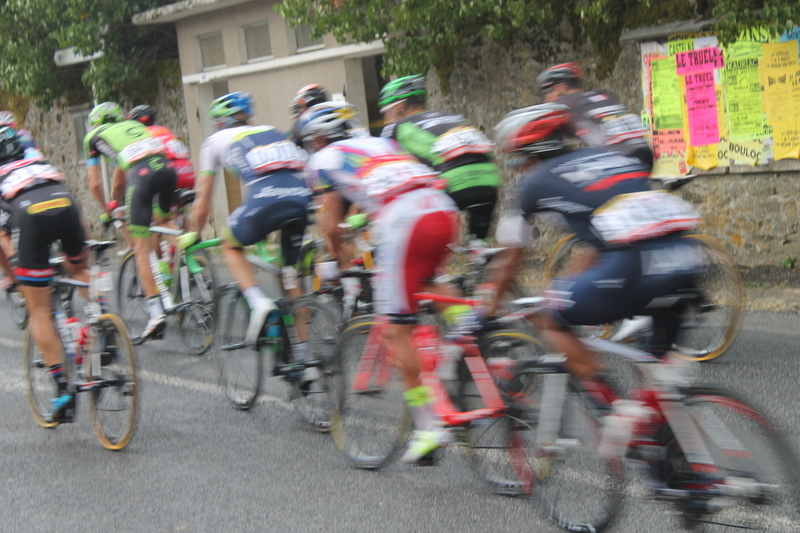 Before the dark cloud arrived it was preceded by the helicopters flying above the race then the Gendarme outriders were followed by the lead group, which included Sagan (in Green). 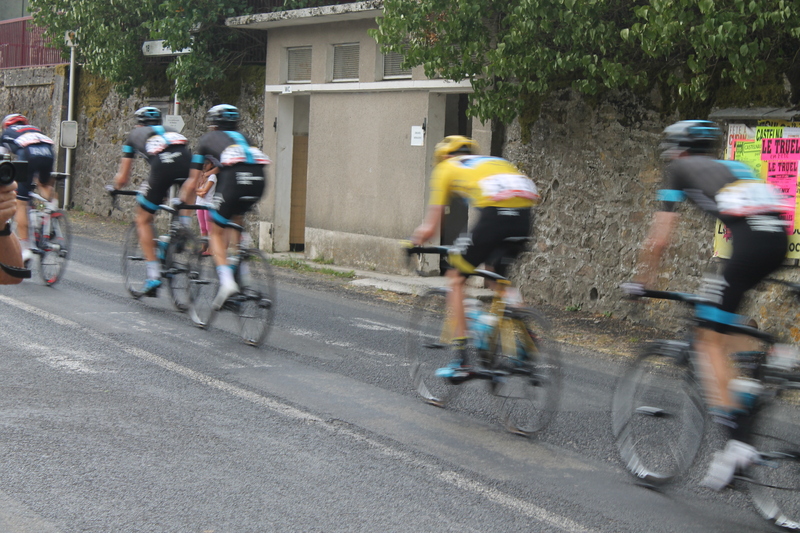 Not far behind came a larger group, with Sky and Froome towards the front of it. Again we spotted Europecars 129 Tommy Voekler as the third group went past followed by the long line of team cars and one chap who’d obviously had a problem of some sort who was trying to catch up through the traffic. He was no-doubt hoping to do so before they went up a wee hill just up the road. Heading back to the car we set off looking for lunch knowing we’d been very lucky to see so much on both days. I’d feared it would be a bit rubbish for Chris who – though he likes Mitzy – had come over to see the Tour. If we’d barely seen anything through a crowd and then the bunch had steamed by in 4 seconds it would have not really been worth it. Thankfully that wasn’t the case and the thunder and rain arrived after we were nicely settled in the car. Getting lunch was not so easy our options were limited – a few places were shut up and one village was emblazoned with posters and homemade signs supporting the local rider Alex Geniez – who did a ballsy lone breakaway the next weekend. We stopped in a McD’s in Rodez for ease and as unlike the day before we needed the loo! The place was full of other Tour fans with their free hats and stuff.